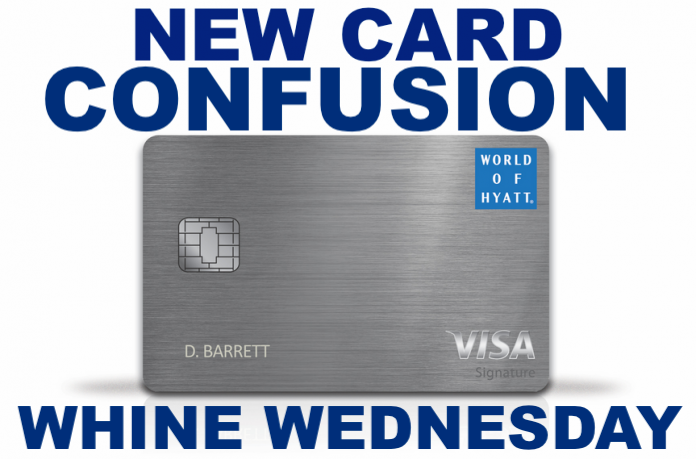 Our Whine Wednesday topic this week is the Hyatt Credit Card issued by Chase Bank which allows members to earn 2 qualifying nights per each US$5000 spent with this card. Chase Customer Service Representatives have been giving many conflicting answers to customers who inquired about how their spending would be attributed when going shopping during the last month of the year when their statement actually closes in January. I have previously written about the newly revamped Hyatt Credit Card which is available to eligible customers in the U.S. market and has been very popular. The feature of receiving 2 additional qualifying nights per US$5,000 in spend is very attractive for big spenders as there is no limit to this. With a very heavy spend one could even get all the way to Globalist status though that would require $125,000 for 50 Nights plus the 5 credits from the card. Even for a somewhat ‘normal’ spending pattern It definitely helps a lot on the way up to Globalist or mid tier status. This option of earning additional elite nights through spending on the Hyatt Visa Card has now drawn criticism from customers who were given incorrect information by Chase in regards to how their spending would count. Apparently during previous communication Chase said that all of the spend accumulated during one statement period would apply at the time and for the year whenever the statement closes. 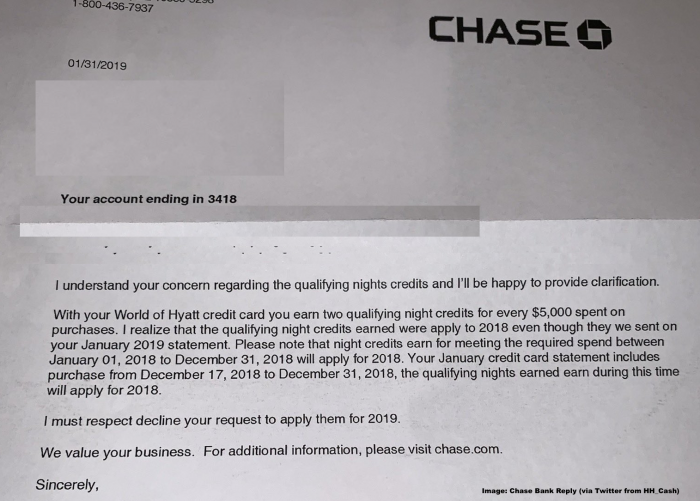 This has been contravened by what actually happened: Chase measured how much was spent until December 31st 2018 and then credited applicable qualifying nights to to the last calendar year. Christmas time is traditionally a big shopping period for obvious reasons and the member was assured that using the Hyatt card for his purchases would count towards 2019 since his statement closes in early January. That didn’t happen. I think there is a lot of chaos within Chase and their CSR’s when it comes to actually giving reliable information about their products. I remember when I contacted them about upgrading the old Hyatt card to the new one and getting three different answers from three different CSR’s on the phone. In the end I sent a secure message through the online account. At least I have a written statement now in case I need to go after Chase regarding my anniversary free night. I don’t necessarily have a problem how that system works but what I hate is when the bank isn’t able to give you a definitive answer about it ahead of time and then screws the customers strategy for the loyalty program. In this case the reader would probably have used a different card with better benefits.